Before the first Earth Day was held in 1970, American farmers dealt with the aftermath of the Dust Bowl that hit the Southern Plains throughout the 1930s. Farmers recognized that their farming practices needed to change to prevent continued loss of topsoil. Today’s farmers continue to see the need to protect an array of cherished natural resources—clean water, clean air, pristine wilderness areas and other natural habitats, and abundant wildlife. This need to protect our natural resources comes at the same time farmers need to increase production. Today, half of all food grown around the world is made possible through the use of fertilizer. Yet, by 2050, the world’s population is expected to reach 9.6 billion. The rapidly growing population, coupled with rising prosperity is boosting demands for grain-intensive meat production. Meanwhile, the number of arable acres available to feed a person is shrinking drastically. Also by 2050, we’ll have only 0.4 acres available for each person. That’s slightly larger than the lot of the average single-family home in America. While organic and commercial fertilizers are crucial to our ability to feed the world, these nutrients, particularly nitrogen and phosphorus, need to be applied in a sustainable way to mitigate risk to the environment. Some days, the sum of these interconnected challenges seems like it could overwhelm our industry, modern agriculture, and our environment. So, it’s every day – not just Earth Day – that drives us to innovate within our industry and partner beyond it. For fertilizer use to be sustainable, we know it must support cropping systems that provide economic, social, and environmental benefits. The fertilizer industry supports the 4R Nutrient Stewardship initiative as a set of best management practices that promote using the right fertilizer source, at the right rate, at the right time, and in the right place (4R). The industry knows farmers are looking for answers about how using combinations of 4R practices will work on their farms. To help answer these questions, the industry has contributed $5.8 million toward 4R nutrient stewardship research that currently supports 25 projects in the United States and Canada. The fund has generated an additional $7 million in research funds by leveraging public and private dollars. When it comes to fertilizer production, the industry is making strides to reduce environmental impact. According to the latest State of the Fertilizer Industry report, fertilizer producers captured an average of 25 percent of emitted greenhouse gases. These are GHGs that are used in other industrial processes rather than being emitted into the atmosphere. The industry has also reclaimed about 1.4 billion gallons of water, enough to fill 2,100 Olympic-sized swimming pools. We’ve got the data, so see for yourself how the industry is improving its process and reducing its footprint. 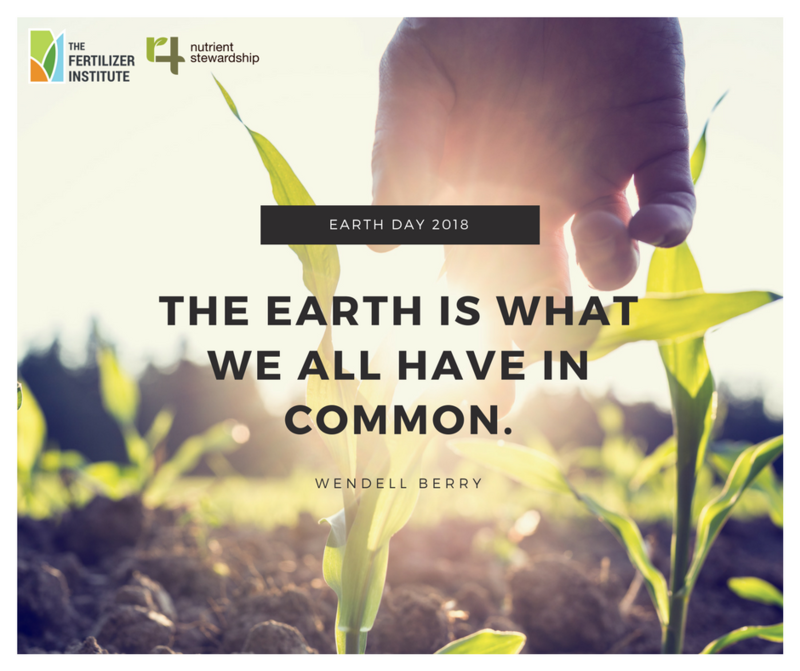 This Earth Day, TFI has cause to celebrate. Our members are producing innovative crop nutrients that nourish farmlands around the world. We’re doing our best work together to protect the Earth’s natural resources.